Megah Sari Sambal Petai (Sator Chili Sauce) in 8.8oz (250ml) jar. Sambal Petai is also known as stinky bean. 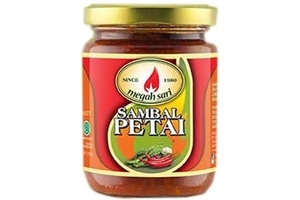 The spicy taste of this sambal provides excellent savory flavor to every cooking. This sambal can also be used as a cooking ingredient. Product of Indonesia. Halal Certified حلال. chili, sugar, salt, red onion, stinky bean, spices, monosodium glutamate, sodium benzonate.